Opening on Christmas Day is director Angelina Jolie’s Unbroken. 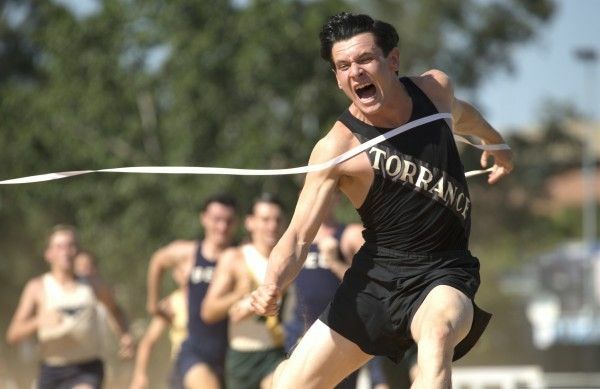 The film tells the incredible true story of Louis Zamperini (Jack O’Connell), a former Olympian and WWII bombardier whose plane crashed at sea in 1943. 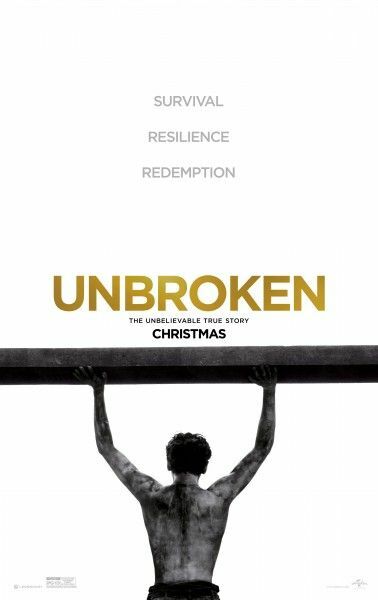 Zamperini and two crewmates floated adrift for 47 days and 2000 miles, eventually finding themselves caught by the Japanese Navy and sent to a POW camp where Zamperini was targeted by a sadistic overseer. 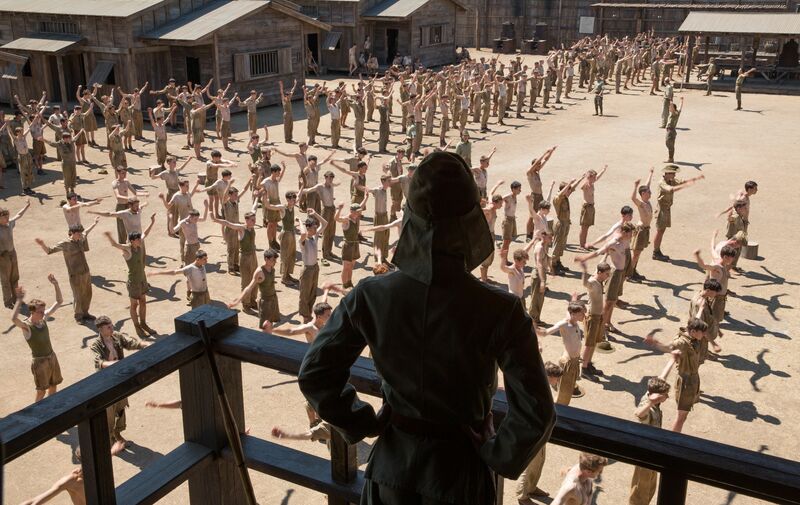 While Unbroken could have ended up a movie of the week on Lifetime, Jolie has crafted a film worthy of your time and money. 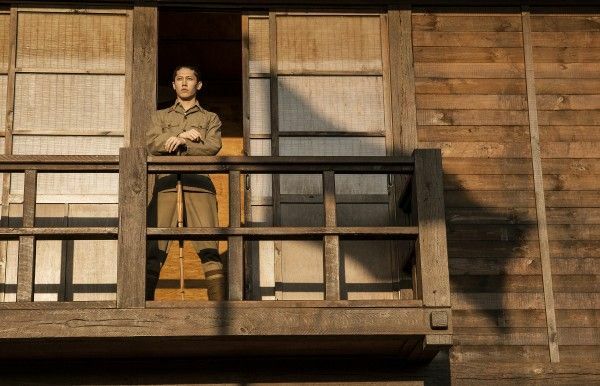 For more on Unbroken, check out six clips, the trailer, and all our previous coverage. At the New York City press day I participated in a press conference with Angelina Jolie, Jack O’Connell, Garret Hedlund, Miyavi, and Finn Wittrock. They talked about what it was like making the film, if it was tough getting a PG-13 rating, what it was like playing real people, how Jolie decided what pieces of the book to include, how the first cut was three and a half hours, the editing process, what the Coen Brothers contributed to the film, and a lot more. Hit the jump for what they had to say. Click here to listen to the audio of the press conference. Otherwise the transcript is below. Question: The rating of the movie is PG-13. How hard was it for you to get that rating? ANGELINA JOLIE: I thought often in making this film about my children, my sons who are in the age appropriate to see it—the older sons. It’s a movie for everybody but it’s one, you think about this great generation and the values they have and how they were as men, and it’s one that we want to raise our children and remind this generation of their sense of family and community and honor, and pay respect to them. I want my children to know about men like Louis, so when they feel bad about themselves and they think all is lost, they know that there’s something inside them. That’s what this story speaks to, it’s what’s in all of us. You don’t have to be a perfect person or a saint, or a hero. Louis was very flawed, very human, but made great choices and was in the end a great man. This is a true story, how difficult was it to recreating these characters? JOLIE: How fun was it, Finn, to create them? FINN WITTROCK: Um, it was great to eat when it was over. I think my eyes were very open to when I got to meet Louis. You know you play a real person, you know that this guy really lived but when you meet someone who watched your character literally starve to death in front of them, actually to wrap your head around the fact that I’m playing someone that you saw die in your arms, there’s a heightened sense of reality and responsibility. You feel like, we don’t know much about who Mac is or was but somehow I feel like I have to do his spirit justice. He could be any of our grandfathers. I think we’ve all felt that sense of responsibility. Also, that we were in service of the story is bigger than any of us. I think that was the thing to keep reminding yourself of when you were in the trenches and when you had four blueberries for breakfast. You pushed yourself because you wanted the story to be told. JACK O’CONNELL: Here’s a fun fact, Domhnall lost so much weight even his eyeballs changed shape. WITTROCK: Yeah. He came back and the contact lenses didn’t fit anymore. JOLIE: They were wearing contacts for all the red lines and they fit when he was starting to lose weight and then when he finally got to the end of the raft, of the diving section, and they didn’t go under his eyes. I think it was the dehydration. WITTROCK: He’s got weird eyes. It was like misshapen but they were even more. O’CONNELL: He dropped contact size. WITTROCK: [Laughs] Yeah. His eyes were skinny. What was it specifically about this book that made you feel so passionate? Was there one specific thing when you were reading it that you said, “This is it, this is my next movie?” And was the movie you just did with Brad, By the Sea, sort of an antidote to this epic that you spent years on? JOLIE: By the Sea was emotionally difficult because it was acting but it was logistically a walk in the park in comparison to Unbroken. It was a nice break. I think what it was, like everybody, we wake up, we read the news, we see the events that are around the world and we live in our communities, which is heartened by so much and we feel overwhelmed. We don’t know what’s possible and we want something to hold on to, something to believe in, something to give us strength. And I was halfway through his book, and I found myself inspired and on fire, and feeling better, and being reminded of the strength of the human spirit. And the strength of having a brother like Pete to remind us to be that for each other and how important that is to have that in your life, so many things. I realized if this was having this effect on me and I knew it was having this effect on so many people, isn’t this what we needed to put forward into the world at this time? I believe it is and I’m very happy it’s coming out also during the holidays. It’s an important time. It’s the right time. With so much interesting story content, how did you decide what pieces of the book would be compelling enough to include in the length of the film from what could be abandoned? JOLIE: That was the hardest thing. That was I think why it took since 1957 when Universal first got the rights to do it. What we did at the end was, we looked at the themes of his life. The Coen brothers said something to me that helped me with it completely and they said, “When you put the book down, you have a certain feeling, a certain understanding. That’s what they need to feel when they walk out of the theater. That’s your job, to literally put this book on film, you won’t make a good movie, you’ll do no service to anyone. So, know the themes.” Then we would go back through the film. For example, faith, faith is so important to him, and instead of being a specific chapter, I had to put it all in, in all the experiences of his life. Faith was represented from the beginning, from the little boy and represented all through the film in other characters but also the sunrise and the darkness, the light and the struggle between them, and him coming into the light. But it wasn’t literally, technically as it was in the book but the themes are the same. That’s what we tried to do. I think a lot of our favorite stories aren’t on the film, I know for Fitzgerald there’s so much of his life. You can do a whole story on Fitzgerald. I think that’s for all of them. These men were so complete and so interesting themselves. You can do a story on the raft. GARRETT HEDLUND: Do the whole story just on like the superman and seeing other supermen coming back for the six hours, having Domhnall behind there holding with all this might for six hours. That’s so heroic. JOLIE: It was tough. It’d be tough too because I’d be carrying the book—I’m sure this happened to all of you. I don’t know if it did but before we were doing the film, I would carry the book around, read it on the plane and do something. Everyone would see it and a lot of people would say, “Oh that’s my favorite book. You know what my favorite scene is?” And I’d start to say, “Don’t tell me.” Imagine it was when he stole the Nazi flag or something, but I just can’t recreate the streets of Berlin. I was wondering, for each of you, what your loved ones felt seeing you up on that screen so emaciated and just in general, how your families felt after the movie? JOLIE: Miyavi has never acted before and he wasn’t looking to act either, so we had to convince him. But his wife has seen it. Your wife has seen it? MIYAVI: Oh yeah, yeah. She’s seen it. JOLIE: I know I remember showing one of the scenes. I was so impressed with your work but of course the character and the time is very aggressive. And I remember showing your wife one scene and I was so proud of his skill as an actor, it didn’t cross my mind that I was showing her, her husband in a certain light. I remember when she first saw it, she said she’d never seen your face like that or your voice like that. What did she feel when she saw the film? MIYAVI: She got scared. That’s the compliment. I felt responsible, a lot. I have two daughters, 5 and 4. I think it’s too early to let them watch this film. Their father keeps hitting people, torturing, killing. It’s tough work but the message of this film is really meaningful to everyone, even to Japanese people. I was scared but even my family and my children will receive Louis strength and his attitude toward life. I really think it’s going to be so meaningful to everyone who’s suffering in their lives. O’CONNELL: Yeah, my mom cried quite heavily. O’CONNELL: She needed to cheer up if you ask me. It was buckets of tears. JOLIE: How can you as a mom watch your son go through so much? O’CONNELL: Can I do an impression of her? JOLIE: Please do. Can you do an impression? HEDLUND: I’ve got plenty. The first time my mom saw me do a death scene it was just [laughs]… But I mean, Finn’s mom watching this is going to be like my mom when she first saw me do it. Because I’ve done about 3-4 times now, she’s over it. HEDLUND: I want to see the impression first. O’CONNELL: “Oh, Jack. It was just so gorgeous. I don’t know how you all did that together for that long.” In tears. HEDLUND: Mine’s much more like, “Honey, if you don’t warn me the next time I walk into a theater that you’re going to die and I’m going to have to cry and embarrass myself in front of all those people, I will slap you across the face.” I love her though. How long was the first cut of the film and what was the most challenging part of the editing? O’CONNELL: Will there be a director’s cut, Angie? JOLIE: There’s only about four of five scenes that didn’t make it, everything’s trimmed. They’re DVD scenes but I was very worried at first because one of the obvious things to lose was Quajling. Not for me, I was going to go to the mat for it, but plotwise you could bring right to the camp. I thought that was the heart of the film, that was a good 15 minutes, 20 minutes originally, and eventually it came down to 9 minutes. It was things like that, so I was scared for a long time. To trim it down without losing anything that you love—there are a few things you have to sacrifice that I’m sad aren’t there but you have to listen to the audience as well, what they’re feeling. Even if they say I like that scene but the raft still feels long, you got to listen to it. We made this for an audience. Sometimes you make a film and it’s very much your artistic creation and you’re putting something in for an actor but this one is for the audience and so, we adjusted it so they could absorb it the best that we feel they could. Louis dedicated his life to God, you mentioned how it was tough to include everything, including parts about his faith. However there’s nothing about Jesus, nothing about Billy Graham, arguably one of the most crucial moments of his life. Why did you choose to make the faith so generic? JOLIE: I don’t think it’s generic at all, I think it’s universal. We made it universal, not specific to one faith and that was something that was agreed upon with Louis. JOLIE: He said he wanted the message to reach everyone. Did he say to make his faith universal? JOLIE: He said to make faith and forgiveness universal. He said, “This is about reaching everyone, this is to speak to everyone.” And we were very clear on his parents’ faith, on them being Catholic, we were very clear on Phil’s faith, very clear on him praying. Any opportunity, if you were looking for symbolism and miracles in the film, you will see them. When choosing Miyavi, he’d never acted before. You did an amazing job. How was it to get into that mindset? 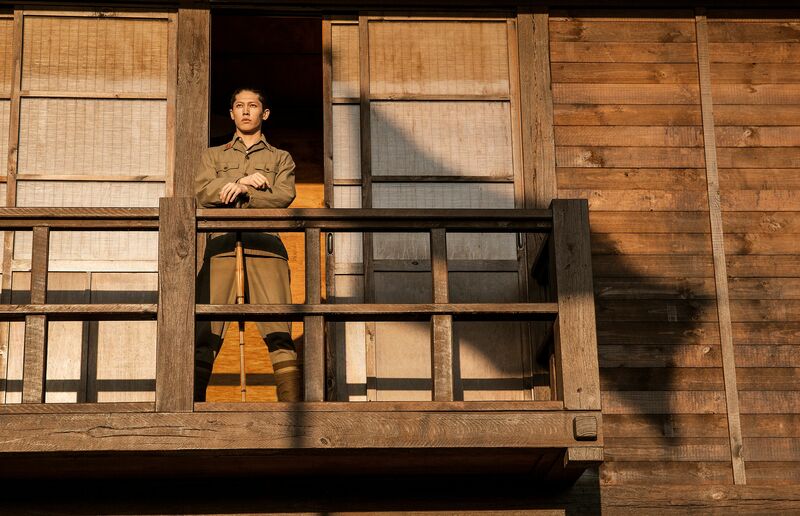 JOLIE: It was very important to us to not cast a stereotype, a Japanese prison guard, but also be accurate to what time it was, he was a very educated man and he was described as very striking, very strong physically. So, I had this thought of somebody who would have a real presence and I thought, a rock star, somebody who’s been a front man because that is a very unique talent, to be able to stand in front of thousands of people and hold that. I looked him up and I was blown away by his talent and his ability. I wanted to know what he was like as a person because before his talent as an actor, I believe strongly if you’re playing somebody dark, you have to cast somebody who’s very balanced, a very good person, somebody who doesn’t enjoy violence, somebody who doesn’t indulge in it. And so, they met him, didn’t know why—they didn’t tell him why. Yoko, when she met you. She called me and said, “He’s a very good man, very balanced dad, husband. In fact, the truth was, because of his—and I’m speaking for you—but the scenes to bring him to violence were so against his nature that it carried this complexity that the character deserved. You could see he seems mad, he was driven, he was in balance. Was he able to mingle with the cast or did he stay away? JOLIE: Did you spend time with the cast? MIYAVI: No. On set we had to keep the distance from each other. Thanks to Jack’s hard accent, I was not able to understand what he was saying. But no experience, a lot of pressure, at the Japanese, I was distant because controversial story. And of course, I didn’t want to represent any negative side of the country I was born and raised. She said she wanted to make something meaningful that could be a bridge between America, Japan, countries which have been having the similar issues and conflict. Then just hitting people—I’m not used to hitting people. I’m always hitting the strings of the guitar not people, so it was tough process but the more evil I become, the more dramatic the story gets. Then to deliver the message to the audience is our mission. I tried to imagine, if they killed my family, daughters, I would do anything to protect my family. It’s insane but that’s the situation everybody was in. I really think and I believe that’s really worth it. I’m curious about your collaboration with the Coen brothers. Can you talk about what they brought to the project and how long you worked with them on it? JOLIE: I don’t remember how long. It wasn’t extremely long—like a couple months at the start and then it carried on. As I had said before about them helping with the structure, I think one of the great things about the Coen brothers—and I think it was important for this film—is this film could’ve easily gone sentimental. It could be too earnest about this and so beautiful and well-meaning and the epic adventure of it all, but would we understand that we had to keep it sharp and keep it open, and keep it entertaining for an audience. And they’re so smart, they’re so witty, they have such an extraordinary way of communicating with an audience in a such a clean way—with just a few lines or just a gesture from a character, they say so much. So, they were really helpful to help with the personalities and of course, with the structure. A big part of it was, how do we structure this? Where do we go back and forth? How do we keep the audience and when do we stop using flashbacks? Being directors, obviously, and being the Coen brothers, they were just so brilliant and they had those—especially the last hour—one thing here or there that would just help it all come together. Why do you think Louis Zamperini’s indomitable will and redemption continue to resonate with audiences nearly seven decades later? O’CONNELL: Sorry, what was your question again? JOLIE: Oh, you just wanted it so badly. O’CONNELL: It’s timeless, I think, it’s timeless. Angelina explained a very relevant, important point recently that Louis’s generation sadly enough are nearly all gone. We then owe it to ourselves, we owe it to them first and foremost, to keep passing their accounts down. They’re from such a sacrificial generation. Everything we get to experience today, I believe, was at a cost. It’s key that we remember this so it’s now our responsibility to ensure that generations beneath ours are also made aware. Louis is just one account, an incredible account but there were many heroes in this generation, as we say, we could make a whole movie on Fitzgerald, for instance. Any one individual, I guess. I consider it timeless and not only that, his ability to find a place of solace and forgiveness, meant that he was able to live to the age of ninety-seven, I guess with some version of closure. What’s the alternative? Hopefully that answers your question. Could you talk about the challenges of directing considering is essentially three different kinds of movies, including a lifeboat movie which is always a lot of fun to do? JOLIE: Finn, still traumatized aren’t you? JOLIE: It was, I came into this because I felt like it was an important story, I was drawn to the message of the story. If you had asked me a few years ago, “What kind of a film do you want to make?” I would never have assumed to make a film that included shark attacks and plane crashes. I would never have thought of myself as handling that kind of cinematic filmmaking. I wouldn’t think I could do that or should do that. But this, I cared about the story and so I had to suddenly learn how to do all those things. It was, to be honest, such an exciting challenge with the team that we had. We had such a great cinematographer in Roger Deakins and our team of visual effects people were just amazing. The thing is, everybody came to this film because they either read the book or knew about Louis, so we were kind of all there with a higher purpose and everybody worked really hard. It was hard work but somehow we got through it. But we did, it confused us many days they would say, “Did you watch Papillon?” And I’d say, “I watched Papillon and Chariots of Fire, and a little bit of The Godfather.” It was, it was many references. Did you guys save anything from Louis or from the filmmaking that he gave you as a keepsake? O’CONNELL: I kept his ring, or a replica of his ring. And after a few more films, I should hopefully be able to afford his flying jacket in some auction somewhere. Was that mission a real mission, it’s like a suicide mission, did that really happen? JOLIE: Oh, yeah. It all really happened and more. Did you keep anything? HEDLUND: Yeah, I kept my ring as well and my prisoner dog tags. O’CONNELL: Of course, dog tags. Yeah.